George Washington was the 1st American President who served in office from April 30, 1789 to March 4, 1797. One of the key events during his presidency was the formation of two political parties - the Federalists and the Anti-Federalists (who became the Democratic-Republican party). There were no political parties in the United States in 1789 when George Washington was elected president. 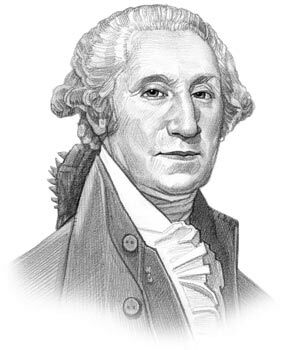 Washington was an Independent meaning that he was not formally affiliated with any Political Parties during his two terms in office. Washington was, however, sympathetic to the political beliefs of the group of men called the Federalists. Definition: The Federalists were the first American political party and formed by Alexander Hamilton, the Secretary of the Treasury, John Adams and Gouverneur Morris. The Federalists believed in the ideas of nationalism and industrialization. All the leading statesmen and politicians wanted to give new Constitution a fair trial and they supported George Washington as an impartial, independent President. But the politicians had wildly different ideas about the government of the new nation. The Federalists believed that the new central government, and the wealthy, well-educated classes, should be given the greatest possible amount of power in the government. The Anti-Federalists, who would emerge as the Democratic-Republican Party led by Thomas Jefferson, believed that the vast majority of ordinary, less educated people, had the common sense and the skills required to run the new government. Many of the wealthy Federalists had roots in the British system of monarchy and were brought up to believe that the government should be run by the elite. The idea that the government could be run by ordinary people was completely alien to them. The Federalists believed in the concepts of nationalism and industrialization. For additional facts and information refer to the Federalist Papers. There is considerable confusion between the ideas of the Federalist and the concept of Federalism. You would think that the two went 'hand in hand'. However this is an incorrect assumption. These Federalists believed in a strong, central, National government whereas the concept of Federalism is based on the idea of two co-equal areas of Government. In the US this consisted of the State Governments and the National Government, both having equal power and both able to operate somewhat independently of the other. The political ideology of Federalism was actually the belief of the Anti-Federalists. The Federalists (really Nationalists) believed that the national government should have more power than the state governments. What were the names of famous Federalists? Alexander Hamilton, John Adams, James Madison, John Jay, Benjamin Franklin, Gouverneur Morris, Thomas Pinckney, Timothy Pickering and John Marshall. The Federalists held a strong base in the cities and in New England. The Federalists were concerned about the excesses of democracy that had been indicated in popular disturbances like Shays Rebellion and the pro-debtor policies of many states that forgave debts and printed more money. What were the names of famous Anti-Federalists? Thomas Jefferson, George Mason, Thomas Paine, Patrick Henry, Samuel Adams and George Clinton. The Anti-Federalists (who became the Democratic-Republicans) held their political base in the rural South. What influence did the Federalist hold and what were the important actions taken by the Federalist politicians? The Federalists were in power when various acts and law were passed including the Alien and Sedition Acts and Jay's Treaty. They were in power during momentous events in American and world history including the French Revolution, the Quasi War and the War of 1812. During the last years of his presidency George Washington had given office only to Federalists. President Adams did the same and once again only Federalists held high office in the government - 'Jobs for the boys'. This is best illustrated in the incident concerning the Midnight Judges. This all changed when Thomas Jefferson was elected president and denounced many of the Federalist policies, especially the bank and implied powers (the powers exercised by Congress which are not explicitly given by the constitution). The secrecy and views of the Hartford Convention (December 15, 1814 and January 5, 1815) totally discredited the Federalists. The New England Federalists who attended the Hartford Convention found themselves branded "traitors" and the Federalists was never able to regain their lost prestige. Federalists: The article on the Federalists provides an overview of one of the major issues of his presidential term in office. The following video will give you additional important facts and dates about the political events experienced by the 1st American President whose presidency spanned from April 30, 1789 to March 4, 1797.